On the eve of the Great Recession’s seventh anniversary, the U.S. economy has regained all of its recessionary losses across a host of top-line economic indicators. Employment, personal income, stock prices and GDP are all at or near record levels. However, below the surface, not all is well with the economy. Although aggregate measures of economic activity have bounced back, the U.S. economic recovery is not yet complete. In particular, there is still slack in the labor market, with many workers unable to land the type of job that they are aiming for given their individual skill-sets. Other workers have become discouraged and have left the labor force altogether. In Oregon, the overall number of jobs has yet to return to its pre-recession peak, but will no doubt do so before the 2015-17 biennium begins. As has historically been the case, Oregon’s recession and recovery have shown more of a boom-bust cycle than what has been seen in other states. After suffering relatively severe job losses during the recession, Oregon is now experiencing above-average job growth. Employment growth in Oregon accelerated in 2013, and has outstripped growth in the typical state ever since. 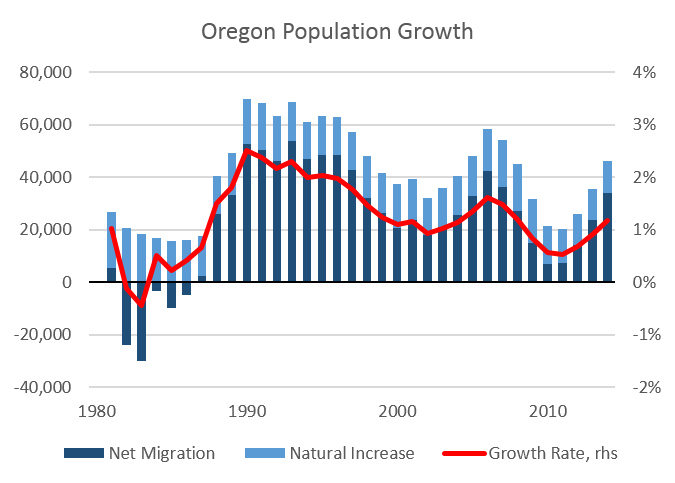 In general, Oregon’s largest population centers have fared the best during the recovery. The Portland area was the first to start adding jobs in 2010, and has grown steadily ever since. There are now 15,000 more jobs in the Portland area than there were before the recession began. Oregon’s smaller metropolitan areas did not begin to expand until the second half of 2012, but many have been adding jobs at a rapid pace since. Leading the way has been the Bend metropolitan area along with other areas that were the hardest hit by the housing downturn. Oregon’s rural communities have yet to see much of a recovery to date. With public sector payrolls stabilizing, the typical rural area finally started netting a few jobs over the past year. Despite recent improvement, most rural areas have just begun to repair the damage done by the recession. The outlook calls for recent job gains to persist for two to three years before longer-run demographic trends weigh on growth rates. The character of the forecast remains the same as three months ago, with employment growth rates relatively unchanged through 2016 and some upward revisions to the out years. The outlook for General Fund revenues in Oregon remains on track for now, with collections closely matching the Close of Session forecast that was used by the legislature when crafting the 2013-15 state budget. Although revenues have mirrored the Close of Session forecast to date, an increasingly strong outlook for April 2015 tax payments, combined with revenue increases enacted during the 2013 Special Session, together suggest that biennial tax collections will approach the 2% personal income tax kicker threshold. An improved job market is fueling growth in tax revenues. In recent months, growth in personal taxes withheld from paychecks has returned to rates similar to those seen during the peak of the housing boom. In addition to gains in taxable labor income, corporate tax collections grew rapidly through much of the year, prior to running out of steam in the fall. Somewhat offsetting this strength in the labor market, weakness in taxable investment income is holding back tax collections. Wealthy taxpayers submitted their amended and extended tax returns this fall, exposing the fact that the 2013 tax year was even weaker than it appeared in April. The April 2014 tax filing season was not a good one for states like Oregon that depend heavily upon personal income tax revenues. Year-end personal income tax payments tied to investment income fell sharply in response to higher federal tax rates put in place during 2013. Many Oregonians cashed out capital gains and other investments in 2012 in anticipation of upcoming federal tax rate increases, leaving fewer gains to be realized for tax purposes going forward. The 2013-15 biennium is far from over, and therefore significant uncertainty remains. One more income tax filing season remains between now and the end of the biennium. As such, many risks to the outlook remain. General Fund revenues have closely matched expectations thus far during the 2013-15 biennium. 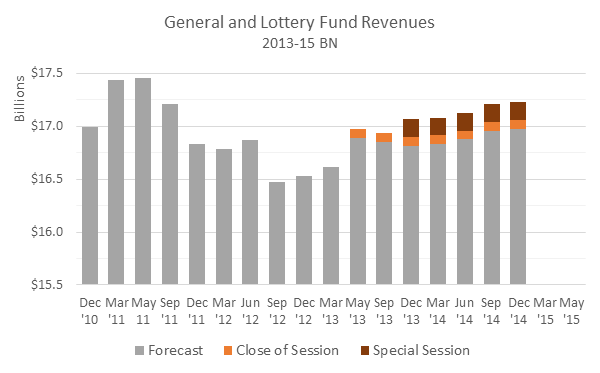 For fiscal year 2014, actual revenues exceeded the Close of Session forecast by less than $10 million (0.1%). However the combination of a somewhat stronger outlook, plus the legislative actions taken during the 2013 Special Session, result in General Fund forecast for 2013-15 of $15,912 million. This represents an increase of $11 million (+0.1%) from the September 2014 forecast. The December 2014 forecast for the 2013-15 biennium is $270 million (1.7%) above the Close of Session forecast. For the full document, slides and forecast data please see our main website or view our presentation to the Legislature below.